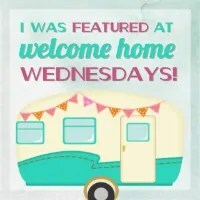 Welcome to Welcome Home Wednesdays #54!!! We’re in the final stretch…lunch boxes. Check. School Supples. Check. Locker assignment check! We’re a week away from the start of school and I’m feeling ready! The kids, not so much. How about you? Are your kids back in school or are you savoring the last few days before they go back? Like any good hosts we’re sitting right by the present table waiting until our guests leave so we can go through the loot… the loot being your Welcome Home Wednesdays #54 links! We can’t wait to check out what you’ve left for us. Trust me there will be a lot of pinning, tweeting and facebook sharing going on in the near future… we can’t wait to show off what you’ve left! Thanks for linking up with us, Courtney! Have a wonderful week! Thanks for the great party this week. Lots of great links this week. Happy Wednesday! Thank you for hosting! I appreciate being able to share my recipes on your blog. Enjoy your week! Thanks for bringing your smiling face every week, Marilyn! Have a great day! Thank you for hosting each week! Hope your week is going great! Thank you for partying with us, Dianne! I hope your week is a great one! Can you believe it?! Summer just came and went! Thanks for hosting! Thanks for linking up with us! Have a great week!